The Value of Jewelry | Antique Jewelry & Vintage Metalwork Auction Guide | Skinner Inc.
By Sheila Smithie, Antique & Estate Jewelry Specialist and Fellow of the Gemmological Association of Great Britain. She worked for ten years as a specialist for Gloria Lieberman in the Jewelry Department of Skinner, Inc. Reprinted with permission from Gold, Platinum, Palladium, Silver & Other Jewelry Metals, by Renee Newman. The heads of jewelry departments of major auction houses, and their teams of specialists, combine to offer many years of experience in their field. Through constant interaction with estate lawyers, collectors and the general public, jewelry specialists review and auction large volumes of old jewelry. They are therefore in an excellent position to recognize jewelry that is collectible but not obviously valuable, even when the items are not signed or even marked for gold content. Specialists can determine jewelry’s metal content with non destructive tests, and, as part of their evaluation, can offer a realistic idea of a likely market value, using their knowledge of comparable items that have been recently auctioned. Fig. 14.3 An antique unmarked 18K gold wirework choker sold for $1,900 in 2009. Photo courtesy of Skinner. 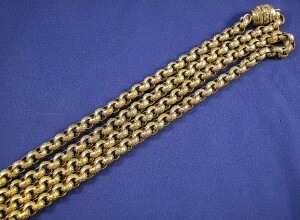 Consider the following cases of unmarked antique and vintage metalwork, handled by Gloria Lieberman and her department at Skinner Auctioneers: The antique chain in fig 14.2 is made of a form of brass called “pinchbeck, ” an alloy of copper and zinc, popular in the 18th century as a substitute for gold. Although the metal content value is negligible, the chain was bought by specialized collectors for $1,100. This modern looking but antique 18K gold (un-marked) wirework choker was found by an estate liquidator under a bed. It sold for $1,900 at auction on December 8, 2009. This was more than three times its scrap value for 24.2 pennyweights. 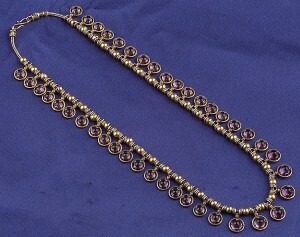 Fig 14.4 An antique 18K gold & amethyst necklace that brought $26,000. Photo courtesy of Skinner. The Archaeological Revival 18K gold and amethyst fringe necklace in 14.4 was found tangled up with other items in a plastic bag stuffed with costume jewelry which Skinner reviewed in the thorough process of conducting an estate appraisal. In such appraisals, no item is overlooked. The owners and the heirs were completely unaware of the value of this necklace, which had been handed down through the generations and was somehow forgotten. Its gold content was unmarked, and the double “C” Castellani hallmark was small and difficult to find without an expert to recognize the work and know where to find the maker’s mark. Castellani were among the most important jewelers of the nineteenth century, and their jewelry, collected by Americans on Grand Tour, is highly prized today. The necklace, even though damaged by harsh treatment, brought $26,000. In other cases, workmanship that appears amateur can lead sellers to undervalue items. They can mistake handcrafting for crude construction and poor taste, as with the unsigned Arts & Crafts period bracelet below. Before scrapping the unwanted bracelet, however, the owners had it evaluated among a group of other gold and costume items. Skinner sent the bracelet to Edward Oakes’ family for authentication as a 1920s work from their studios, and it brought $5,500 at auction. Fig. 14.5 Arts & Crafts period bracelet by Edward Oakes Studios, c. 1920’s, sold at auction for $5,500. Photo courtesy of Skinner. An extraordinary example of fine gold work, whose style fell out of favor in the 20th century, is exemplified by the armband in figure 14.6. It came to Skinner from a pawnbroker and was entirely without hallmarks or signature. Further, it seemed to have been damaged. It had drilled holes that did not serve any purpose, and was missing several small gems. It appeared too large to wear. 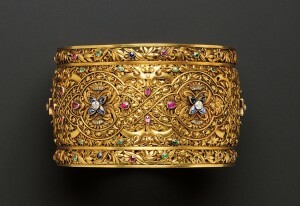 However, research subsequently showed that the piece was an 18K gold armband from the Parisian jeweler Boucheron, and bought by the American millionaire’s wife Marie Louise Mackay in 1876. The drill holes had once accommodated a large detachable brooch, since lost, likely destroyed for the natural pearls with which it was set. Even in this incomplete condition, the armband brought $40,290, almost ten times its substantial weight in gold. Fig. 14.6 An antique Boucheron arm band that brought $40,290. Photo courtesy of Skinner. 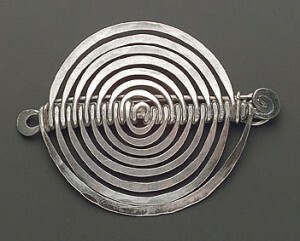 Finally, the large silver brooch in figure 14.7 below was brought to the attention of Ms. Lieberman, whose reputation as an early supporter of artist jewelry during her 40 years in the business is widely known. The owner had purchased the unmarked, unsigned piece at a large garage sale in suburban Los Angeles. Initially reluctant to spend the money on herself, she bought it because it “spoke to her” and had remained unsold after the third day despite the $5 price tag. It was made of a single piece of wire, including the brooch pin. Though the owner did not think to connect the piece to a major modern artist, she nonetheless felt it had intrinsic artistic value and that Ms. Lieberman, whom she knew from Antiques Road Show appearances, would appreciate it. Skinner subsequently handled the brooch’s authentication by the Calder Foundation, whose experts dated it to 1942. The brooch brought $33,000 at auction, well beyond its value as a few ounces of silver. The prior examples, illustrate that the auction market is an important option for sellers to consider. It is vital to understand that presenting jewelry at auction is different from selling jewelry directly to dealers. Fig. 14.7 Calder silver brooch, c. 1942, that sold for $33,000 at auction. Photo courtesy of Skinner. Since auction houses do not buy jewelry but act instead as the seller’s agent, the auction house’s interests and the seller’s interest are mainly aligned. The auctioneer is paid on commission, which is maximized by achieving the highest possible price for the seller At the same time, the auctioneer’s business depends on describing the items accurately to potential buyers, which helps it achieve a good reputation among buyers and high prices for sellers. This positive dynamic benefits all the participants in the market. Sellers should understand that auction houses charge both a standard seller’s commission and an auction premium over the hammer price (paid by the buyer), which are used to cover the substantial marketing and staffing expenses of running an auction. The commission and premium are of course the main source of the firm’s revenue. When sellers are auctioning valuable items of jewelry, the seller’s commission may be negotiable, but this is not always the case if the jewelry’s value is modest. There is often a four to six month time frame before the jewelry can be auctioned and payment made. If the seller needs immediate funds, auctioneers may advance money, but only if important and valuable items are being sold. Each item sold is given an auction estimate based on hammer prices of similar items in past auctions. Specialists should be willing to explain the rationale behind these estimates. Typically, a mutually agreed reserve will be placed on the jewelry to ensure that it does not sell below intrinsic value. Increasingly, antique and vintage jewelry is gaining appreciation as an important part of our cultural and artistic heritage. New jewelry curatorships have been established at major institutions, such as the Museum of Fine Arts Boston, who are pioneers in this area. Many auction house specialists and dealers are highly motivated to share their knowledge and experience in this cause, and owners can both benefit from and participate in this trend. This entry was posted in Blog and tagged antique jewelry, appraiser, auction house, jewelry appraisal, jewelry appraiser, jewelry specialists, jewelry value, metal weight, old jewelry, skinner, value of jewelry, vintage jewelry, vintage metalwork by Skinner. Bookmark the permalink. Good morning, I have a three piece beautiful vintage necklace,bracelet and clip earrings set, However I have no idea who made it.There are’nt any markings on it.Can you help me to know who designed this collection? Thank you. I have a bracelet with the METAL stamp n hallmarks old looking but lovley would love to know more about it. I have a gold bracelet my father gave to me. He said he brought it at a antique store when I was born I’m 45yr old now it has 7 stones and the gold stretches. I would let my family members borrow it at their weddings for something old. People always admire it. I’d love to know its worth. I have a heavy brass necklace. It resembles some Finnish vintage pendants. It has five hanging charms on it. Its chain is also doubled linked. Have a clustered pearl set in 18 karat gold. Made in the far east in the 1920’s approx. I have an antique silver cuff bracelet. How can I find out more about it? How long, generally, does it take to get an appraisal of your item(s) after submitting the online form? You should have received a confirmation email immediately after sending in the online form. If you have received a confirmation it is in the Appraisal Services queue. Response times vary greatly depending on the type and quantity of items you’ve submitted. Please follow-up with Appraisal Sevices if you do not hear anything in a few weeks. I have my grandmother’s Aunts engagement ring that my mother had given me. It is in a Blue Heart shaped like velvet box. I am guessing that it was from 1900. My great great Aunt has passed, so is my grandmother and my mother whom was 82 when she passed. I would like to find out how much this ring is worth. It is white gold i believe with diamond. Our Appraisal team will work together with our Fine Jewelry Department. Thank you very much!